Poor Ellen Tshabalala and her BCom (Unisa) DipLabRel (Unisa). No one wants to believe that the dog ate her homework. 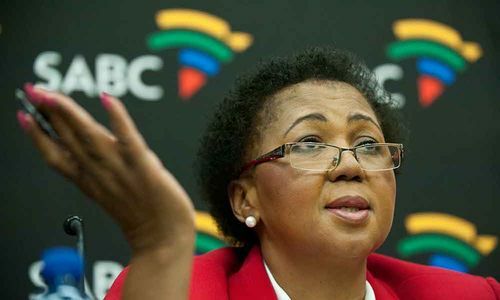 Last week Parliament’s communication portfolio committee recommended, for the second time, that Tshabalala be suspended “with immediate effect” from her position as chair of the South African Broadcasting Corporation (SABC) board because she had lied about her academic qualifications. This is the procedural precursor to Parliament recommending her removal from office. But since it is President Jacob Zuma who actually has to sign the order and since Ellen is claimed to be one of the president’s girlfriends, the African National Congress’ national executive this week urged the recalcitrant Tshabalala to step down. This was presumably to spare JZ the embarrassment of having to fire his squeeze, rather than disapproval over her actions. The lady is having none of that. She is sticking doggedly to her explanation that her inability to produce proof of her claimed Bachelor of Commerce degree and her Postgraduate Diploma in Labour Relations is a combination of theft and political chicanery. First, burglars broke into her home a dozen years ago and stole her degree certificates. Then subsequently, before she could get duplicates, all the examination records and degree transcripts at the University of South Africa (Unisa) were altered by person or persons unknown, as part of an “agenda” against her. Embattled SABC Chairperson Ellen Tshabalala says that the reasons she cant provide proof of her academic qualifications are due to theft . Tshabalala says she doesn’t know who these creatively vengeful perpetrators are. One can only imagine that these are the same villains who targeted Hlaudi Motsoeneng, the chief operating officer of the SABC. His school matriculation certificate mysteriously disappeared some years back, forcing him to have to misrepresent his qualifications when he joined the corporation. Public Protector Thuli Madonsela in February, released a report on what she called Motsoeneng’s “fraud”, recommending that a new COO be appointed within 90 days. In retrospect it is now not surprising that Motsoeneng was a source of such unwavering support from Tshabalala. Not only was he not not dumped, but in July he was appointed permanently to the R2.4-million a year position that he previously held only in acting capacity. In all, this has been a bad year for studious folk in the ANC. MP Pallo Jordan, a former Minister of Communication, was in August exposed by the Sunday Times as not having a claimed degree from the University of Wisconsin-Madison, nor the claimed PhD from the London School of Economics. Jordan apologised and resigned from parliament. Had he known what has become apparent now – that there is a qualifications Tokoloshe who is stalking the ANC’s top cadres and abducting their credentials – it might have been a different story. With some nifty footwork he might even have managed, like Motsoeneng, a promotion and a salary increase out of his own sob story of how the Central Intelligence Agency (CIA) vaporised the university archives on two continents in order to cast him in a poor light. Tshabalala has declined suggestions that she should simply produce some collateral proof of her degrees, like graduation photographs. My suggestion is just a little more rigorous: she should sit any examination of her choice for any first-year module in any of the qualifications she claims. If she does better than the 13% that Unisa says was her top performance during her truncated student years, we can cut her some slack. Alternatively, Tshabalala could enrol in the University of Zimbabwe’s accelerated doctoral programme. Grace Mugabe got her PhD in just two months and everyone knows that she is as thick as a brick – she failed dismally at her English degree studies with the University of London. Of course, it might have helped that Grace’s erudite husband just happens to be the university’s chancellor and also marked her thesis. If Tshabalala indeed has a presidential paramour as claimed, it’s unlikely that the minimal education of Zuma could similarly be inspanned to any use in churning out a doctoral thesis. It is puzzling that these endless comradely lies about credentials are necessary, since the ANC doesn’t appear to hold much truck with academic qualifications. It described the expose of Jordan’s lies as a “publicity gimmick”, and said that there had been “no violation [by Jordan] of parliamentary ethics code or misrepresentation”. And when Tshabalala’s false qualifications were exposed by City Press, Zuma’s spokesman Mac Maharaj responded that this was immaterial, since “a university degree is no prerequisite for the appointment”. Motsoeneng went further, saying that his experience at the SABC was that employees with university qualifications were “a drain” on their colleagues. Meanwhile, if it is of any consolation to Tshabalala, the scourge of vanishing qualifications is not only an ANC problem. For the life of me, I just cannot put my hands on the beautifully embossed certificate attesting to my PhD in Rocket Science and, in the archives of my alma mater the Massachusetts Institute of Technology, I am willing to wager there is just a black hole. It’s the Tokoloshe who done it.